Plenty of Videogames "Do The Mario"
Running, jumping and having his size altered by various mushrooms are far from the only tricks up Mario's sleeves. He's also provided inspiration for dozens of games, in all kinds of genres. Aside from being enormously fun to play, the Mario games have inspired countless imitators and successors, and not just rival platformer games either. In issue 283 of The Escapist, Michael K. Stangeland Jr. shows how the ever-present hand of everyone's favorite mustachioed Italian plumber can be found guiding the fate of kart racing games and party games, in addition to his usual duties as king of the platformer. 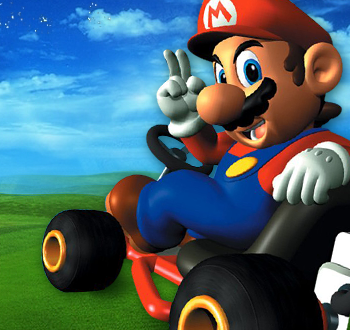 Whatever influences Mario has had on other genres, however, is arguably trumped by what Nintendo has accomplished with its famous Mario Kart series. Whereas most genres manage to diversify if given enough time, it's much more difficult to say the same for kart racing. Through Mario, Nintendo essentially invented the sub-genre, and 18 years later, absolutely no new kart racing game is released without the shadow of Super Mario Kart hanging over it, not even one from Nintendo. The gameplay of Super Mario Kart is a drill that should be well known to anyone familiar with the genre. Take one part cast of colorful and already familiar characters, seat them in little high-powered vehicles, add a healthy helping of fun power ups, and then race them around increasingly nutty themed tracks. It's a combination so strong that any attempt to copy it can inevitably be summed up as "Mario Kart with X". Diddy Kong Racing is Mario Kart with Diddy Kong and friends. Sonic & Sega All-Stars Racing is Mario Kart, Sega style. Crash Team Racing is Mario Kart with Crash Bandicoot. Even games that aren't "Kart" racers, per se, can get the label attached to them if they follow the basic gameplay close enough, such as Blur. Mario's influence extends even beyond the three genres that the games directly touch, with countless developers finding some seed of inspiration within their cheerful confines. You can read more in Stangeland's article, "Defined by Mario."